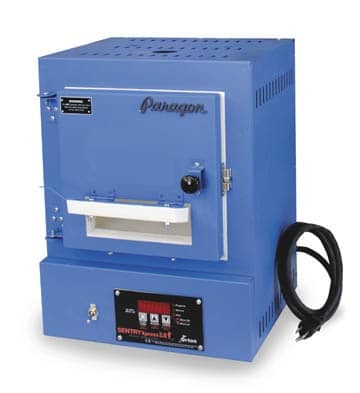 The digital SC-3 kiln fires silver clay, decals, china paint, enameling, and glass in minutes up to 2000°F. The SC-3 is popular with seminar teachers because it fires so fast, plugs into a 120 volt outlet, and is easy to sell. The fast firing element is embedded in the firing chamber shell. The SC-3 heats from the two sides and back. It includes a top vent for lost wax casting.